Sibling rivalry is the inevitable result of having more than one child, as children struggle to claim their places within the family and to define themselves as individuals. They compete for parental love and attention, fearing they won’t get their “share.” Engaging with one’s brother or sister in sibling rivalry is also stimulating and appealing. It can give younger siblings power over older ones. It’s a wonderful antidote to boredom; a child has their sibling’s attention, and more often than not, a parent also becomes fully engaged in a high-energy way. As adversarial as it may seem to parents, most sibling fighting is actually evidence of an unspoken agreement between children to fight. It really does take two to dance the sibling rivalry tango. A dance which can provide real benefits to children. It’s an excellent laboratory for experimenting with self-assertion, agreements, and compromise. Here children can learn how to get along with people with different personalities, interests, and needs. It helps children develop toughness, resilience, patience, and empathy. So what can we do to de-escalate the conflict, keep our sanity, be able to enjoy our family, and allow our children to gain the benefits of a healthy sibling rivalry? Often they’re just playing. Don’t assume it is a fight, even if it looks and sounds like one. Check with them. In my experience of working with countless families, these annoying behaviors are frequently some form of “play” and children are quite honest in admitting that. They enjoy a lot about the skirmishes and don’t want to give them up. If it is play, they can take it outside or somewhere away from you or find something else to do. If it is a fight, teach them skills to solve their conflict rather than arbitrating it for them. Teach problem-solving skills. 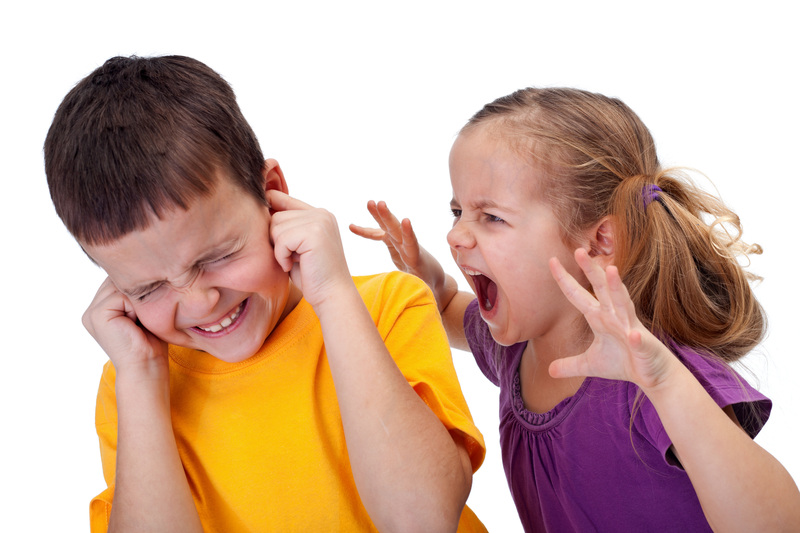 Sometimes kids fight because they actually don’t know how else to resolve their disagreement. Begin by describing out loud what you see, without taking sides or placing blame. “I see two boys and one truck.” Each child can explain what he or she is feeling, while you listen respectfully and reflect back what is said. Empathize with their feelings without passing judgment. Encourage the children to come up with their own solutions to the underlying conflict and to agree upon one to try. Step in only if their plan is dangerous or unreasonable, sending them back to come up with another idea. Do not solve it for them, although you may offer ideas if they are stuck. When they have crafted their own agreements, they will be invested in making them work. Once they have learned the skills, you can step back and trust them to handle it. Have faith in them and communicate a belief that they can work it out, rather than the assumption that they are unable to get along. Set limits on unacceptable behaviors. Each family will draw their own lines according to their family values. Limits might include things like no harming others and no destruction of property. Roughhousing can only be by mutual consent. Any object that is the source of fighting will be put away for a specified period of time. Fighting that irritates others will be taken outside. Tattlers only get a parent’s ear when reporting something dangerous. The consequences for breaking the limits should also be laid out in advance as much as possible. Fighters will be separated for a cooling off period. If one child hurts the other, they should be involved in the healing, such as bringing ice or bandaids. All participants share in any restitution for damages. This can be done by repairing or replacing the damaged object, by working it off, or through some agreed upon creative plan. Maintain a neutral position. Don’t take sides. All combatants should be treated alike—no matter who started it, who said what, or who did what to whom. Because in fact, you don’t know what each has done to fuel the fight, even if you were right there. Those side-ways looks, invasions of personal space, and other incendiary actions often fly right under our radar. And even if one child is clearly the instigator, we don’t want to unintentionally encourage sibling rivalry by teaching them to play victim or that a sure-fire way to get a sibling in trouble is egg them on until they lash out. So when fighting happens, treat everyone the same way—ignore them both, help them both with problem solving, separate them both for a cooling off period, or impose the same consequences on both of them. Making sure that each child has some one-on-one time with you, where you enter into their interests and activities, minimizes their need to compete for parental attention. Giving children real jobs to do within the family not only gets the work done but also has positive side benefits—a child who is responsible for the family pet or makes the family dinner every Thursday is less likely to seek negative ways to feel important. Frequent fun activities shared by the whole family build goodwill and a portfolio of positive ways to interact. Allow some selfishness. Everyone needs their own time and space and interests. Each member of the family—parent or child—should have a place and things they can call their own and not be required to share. Look to our own behaviors. What are our children observing and learning from us? How do we treat others? Solve our own problems? How are we treating our children? Are we explicitly or subtly comparing them? Favoring one? Casting them in roles such as the athletic one, the smart one, the difficult one? Do we work so hard at treating them fairly and equitably, that we’ve created an unhealthy focus on each insisting on getting their share, rather than creating a general atmosphere of mutual respect, support, and fairness? Address sibling abuse. Not all fighting between children is sibling rivalry; children can be bullies or abusers. What distinguishes abusive behaviors is that their purpose is to tear down or harm the other child, not to compete for parental attention. Mutual consent is lacking. One child is always the victim and may consistently try to avoid the aggressor(s). Sometimes the victim may then turn around and abuse a younger child. Physical abuse includes the use of weapons or age inappropriate hitting, choking, biting, or slapping. Emotional abuse can include severe ridiculing, intimidating, teasing or provoking. Sexual abuse includes sexual touching and indecent exposure. If you suspect abuse seek help. A trained professional will be able to more objectively evaluate what is going on, advise you, and provide the help family members need. Enjoy your vibrant family. As parents turn over responsibility for resolving sibling conflict to the siblings and as children develop their skills in self-advocacy, problem solving, and conflict resolution, things will improve. As parents worry less about the fighting, their own energy and attention is freed up for other things. But lest things get too tranquil, the occasional flare-up will add a little spice to your day, just as it does to your children’s.